Get Crafting with Inner Tubes in print! You guys, Andrea Rangel (who you may remember from this post on knitting activewear for winter cycling and this post on choosing a knitting stitch pattern) just told me about MagCloud. It’s a site that lets you offer print on demand booklets and magazines, and it’s what she uses to print out her lovely materials for her knitting classes. 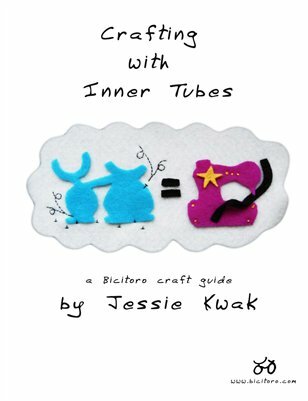 I’m using it to print out copies of Crafting With Inner Tubes – and I’ve listed the book for sale on their site. So if you’ve been wanting a physical copy, now’s your chance! By the way, I’m fully aware that it’s been ages since I’ve posted here. I have so so so much I want to talk about, and I plan to hop back on the blogging train now that it’s cold and dreary and I’m not out having fun all the time. Want to spend a little more time with me? Then subscribe to my newsletter. It's short, it's sweet, and I make it special, just for you. Never miss a tip, a tutorial, or a long sequence of rambling non sequiturs--er, I mean a post.